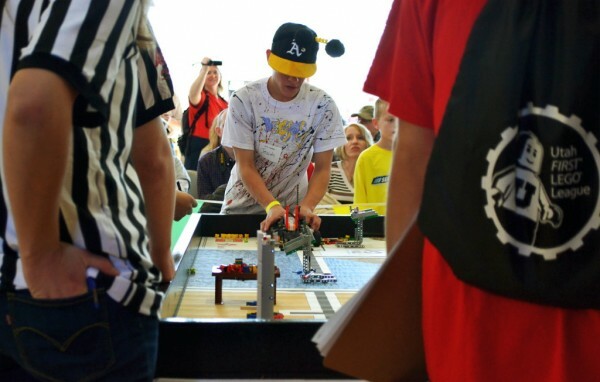 Salt Lake Community College will host Utah FIRST Lego League (FLL) competition for the first time, but needs volunteers to make it happen. SLCC needs at least 50 volunteers to help with the qualifying round. Volunteers will be filling critical roles such as judges and referees. Thompson currently has 20 positions filled and needs more volunteers. Those who want to volunteer can visit here to fill out a form. Rather than focusing on who can build the prettiest town, this is a test of robotics skill and ingenuity. Kids build robots with the help of volunteer mentors to compete. “This event has kind of flown under the radar.” says Christopher F. Thompson, engineering student at SLCC as well as Utah FLL Event Manager. Teams are given a theme every year to solve a problem using robots that are autonomous. The Lego robots are judged on practicality, robot programming and presentation. Anyone can join the competition, but there is a structure to the teams. The competition is aimed at students ranging from ages 9 to 14. Team rosters include three to 10 kids, an adult coach and any number of mentors. The coach and mentors guide the students’ progress, but the task of building and designing falls mainly on the kids. Teams that make it past this and other qualifying rounds will go on to the state competition and compete with winning teams across the state. The state competition is divided into rounds and will be held at the University of Utah in the Student Union building. Thompson helped bring this program to SLCC after being involved with the Utah FLL for the last two years. He helped as a robot design judge last year and recently stepped up as event manager and SLCC organizing committee chair for the SLCC qualifying event. With the help of SLCC’s American Society of Civil Engineers, Phi Theta Kappa Honor Society, Peggy Hoffman from Student Life & Leadership and Dr. Nick Safai from the Engineering Department, SLCC was given the opportunity to host a qualifying round by Utah FLL. “I have hopes that this program will become a staple at SLCC and perhaps it will help shape and develop students at SLCC in a positive and uplifting manner.” says Thompson.